Definition at line 54 of file parametertable.h. Definition at line 30 of file parametertable.cpp. References initTable(), parameterStatusChanged(), signalChanged(), and slotCellChanged(). Definition at line 143 of file parametertable.cpp. References FROM_UTF8, CModel::getCompartments(), CCopasiObject::getObjectName(), and CCopasiVector< T >::size(). 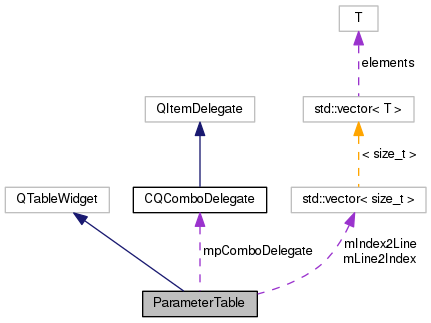 Definition at line 127 of file parametertable.cpp. References FROM_UTF8, CModel::getModelValues(), CModel::getNumModelValues(), and CCopasiObject::getObjectName(). Definition at line 57 of file parametertable.cpp. References CMetabNameInterface::getDisplayName(), CReactionInterface::getListOfMetabs(), CModel::getMetabolites(), CFunctionParameter::MODIFIER, CFunctionParameter::PRODUCT, CCopasiVector< T >::size(), CFunctionParameter::SUBSTRATE, and CMetabNameInterface::unQuote(). Definition at line 473 of file parametertable.cpp. Definition at line 46 of file parametertable.cpp. Referenced by ParameterTable(), and slotCellChanged(). Definition at line 499 of file parametertable.cpp. References C_INVALID_INDEX, CQComboDelegate::getItems(), mIndex2Line, mpComboDelegate, parameterStatusChanged(), and signalChanged(). Definition at line 158 of file parametertable.cpp. References CModel::dimensionlessArea, CModel::dimensionlessLength, CModel::dimensionlessQuantity, CModel::dimensionlessTime, CModel::dimensionlessVolume, CModelEntity::FIXED, FROM_UTF8, CKeyFactory::get(), CModel::getAreaUnitEnum(), CReactionInterface::getChemEqInterface(), CReactionInterface::getFunction(), CModelEntity::getInitialValue(), CCopasiRootContainer::getKeyFactory(), CModel::getLengthUnitEnum(), getListOfAllCompartmentNames(), getListOfAllGlobalParameterNames(), getListOfAllMetabNames(), CReactionInterface::getListOfMetabs(), CReactionInterface::getLocalValue(), CReactionInterface::getMapping(), CReactionInterface::getMappings(), CChemEqInterface::getMolecularity(), CCopasiObject::getObjectAncestor(), CCopasiObject::getObjectDataModel(), CReaction::getParameterMapping(), CReactionInterface::getParameterName(), CModel::getQuantityUnitEnum(), CModelEntity::getStatus(), CModel::getTimeUnitEnum(), CReactionInterface::getUsage(), CModel::getVolumeUnitEnum(), CQIconResource::icon(), CReactionInterface::isLocalValue(), CReactionInterface::isLocked(), CReactionInterface::isMulticompartment(), CReactionInterface::isVector(), CQIconResource::locked, mGlobalParameters, mIndex2Line, mLine2Index, mModifiers, CFunctionParameter::MODIFIER, mpComboDelegate, mProducts, mSubstrates, mVolumes, CFunctionParameter::PARAMETER, CFunctionParameter::PRODUCT, CQIconResource::reactionModifier, CQIconResource::reactionProduct, CQIconResource::reactionSubstrate, CFunctionParameter::RoleNameDisplay, CQComboDelegate::setItems(), CFindDimensions::setUseHeuristics(), CReactionInterface::size(), CFunctionParameter::SUBSTRATE, CFunctionParameter::TIME, CQIconResource::unlocked, CMetabNameInterface::unQuote(), CFunctionParameter::VARIABLE, vectorOfStrings2QStringList(), and CFunctionParameter::VOLUME. Definition at line 78 of file parametertable.h. Definition at line 97 of file parametertable.h. Referenced by handleCurrentCell(), slotCellChanged(), and updateTable(). Definition at line 96 of file parametertable.h. Definition at line 81 of file parametertable.h. Definition at line 93 of file parametertable.h. Definition at line 75 of file parametertable.h. Referenced by initTable(), slotCellChanged(), and updateTable(). Definition at line 80 of file parametertable.h. Definition at line 79 of file parametertable.h. Definition at line 82 of file parametertable.h.